The pound fell to an all-time low against the euro after weak manufacturing data underscored a gloomy outlook for the UK economy. Sterling dropped to its weakest since the single currency was introduced in 1999, at 75.86 pence to the euro, before later strengthening to 75.63p. The pound also hit a 10-month low to the dollar at $1.9485 in earlier trade. 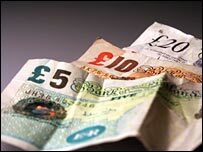 After a strong 2007, the pound is expected to weaken in 2008 as interest rates fall and the UK economy slows. The pound hit a 26-year high against the dollar last year, above $2. Analysts said investors were moving out of high yielding currencies in favour of the lower-yielding yen. "Growth-oriented currencies are all under pressure, weaker sentiment has not helped the pound," Kamal Sharma, currency strategist at Bank of America, said. Data from the Office for National Statistics showed an unexpected decline in the UK's manufacturing sector in November, fuelling expectations of a cut in interest rates. "The pound's position looks increasingly precarious," Bank of New York Mellon said in a note to investors. The Bank of England opted to keep rates unchanged at 5.5% on Thursday but many economists expect the Bank to lower the cost of borrowing in February. A weaker pound would make UK exports more competitive on world markets but it could also make imported goods more expensive and raise costs for Britons travelling abroad. The problem for many economists is that the drop in the pound will not have an immediate effect on economic growth or manufacturing, forcing the Bank of England to cut rates throughout 2008, weakening the pound even more. "While the fall in the pound is a positive, it is unlikely to provide a boost until late this year or even 2009," said Paul Dales of Capital Economics. "We do not think it will be long until the manufacturing sector enters a recession, contributing to a weakening in overall economic activity this year rather than offsetting it."